Full advantage has been taken of the mild winter weather building up the walls of the café, learning space and reception. The copper roof has been completed to the learning centre building and the cladding specialists have moved on to covering the reception roof. The structural wall system has also started on the main exhibition building, the largest of the buildings, beginning to enclose the space and frame more of the views out to the lake. A number of the roofs are nearing completion with the installation of rooflights to the boathouse and café. Pipes and wires are also beginning to appear as the first fix for services begins around the museum buildings. The Lakeland Arts Trust is delighted to announce that the Windermere Steamboat Museum Project has been awarded a confirmed grant of £9.4 million from the Heritage Lottery Fund (HLF). The Project will create a new museum on the lake to display the internationally significant collection, connecting boats, people and stories. The high-quality museum facilities will include a wet dock where visitors will see boats displayed on the water, collection displays where visitors can discover about the people who built the boats, who used them and how they were used, an active conservation workshop and a dedicated learning space. New jetties will also connect people to the lake enabling visitors to arrive by boat or take a trip on a historic launch whilst the lake side café will provide exceptional views across Windermere. Martin Ainscough, Chairman of the Lakeland Arts Trust, said: ‘This decision secures a total of £13.4 million investment into Cumbria creating employment and new opportunities for local people. I would like to thank all the project team members who put an enormous amount of work in to developing the plans for the Museum and securing this fantastic grant for the region’. Gordon Watson, Chief Executive of the Lakeland Arts Trust, said: ‘We are delighted that the Heritage Lottery Fund has confirmed the grant to the Museum and thank them for their tremendous support. Immediate steps are to complete design development so that construction can start next year. We are looking forward to re-opening the Museum and welcoming visitors to enjoy the wonderful collection of Windermere boats and take part in exciting new activities and events inspired by the collections and beautiful site’. Tiffany Hunt, Chair of HLF North West Committee, said: ‘This wonderful collection of historic boats is now set to be housed in a new and sustainable museum, spectacularly located on Lake Windermere. We felt strongly that this was a great opportunity to invest a significant amount of money in an area that relies heavily on tourism as well as reveal the social histories behind the local boatbuilding industry. Equally important will be opportunities for people to acquire traditional skills and get involved with caring for these steamboats which are such a culturally distinctive part of Cumbria’s landscape.’ The Lakeland Arts Trust has raised over £3 million match funding for the project and needs to raise a further £300,000 to meet the total project costs of £13.4 million. The Trust is working with an excellent design team on the project including Carmody Groarke, architects, Arup, engineers and Real Studios, exhibition designers. The Lakeland Arts Trust has applied to the Heritage Lottery Fund for a confirmed grant, having previously secured their initial support and is delighted to announce that it is applying for planning permission to redevelop the Windermere Steamboat Museum as a world-class heritage attraction and a major part of the Windermere Waterfront Programme. This long awaited project will enable the Museum to re-open to the public so that local people and visitors can once again enjoy seeing the unique collection of boats. All the historic boats are associated with Windermere and together they tell the history of over 200 years of leisure, industry and trade on the lake. Gordon Watson, Chief Executive of the Lakeland Arts Trust said ‘this is an important step forward for the project to turn the Museum into a popular tourist attraction which offers a very special and exciting experience for visitors. We want to involve local people and visitors in the Museum and to offer a wide range of activities for school children, families and older people. The Museum has the strategic support of the key agencies in Cumbria and the North West including the Lake District National Park, Cumbria Tourism, Cumbria County Council, South Lakeland District Council and Cumbria Local Enterprise Partnership. Support the on-going maintenance and conservation of the collection. Provide a high quality formal and informal learning programme for children, young people and adults. Deliver a changing programme of temporary displays and public events. Andrew Groarke discribes the design: ‘The new museum has been arranged as a cluster of buildings within the landscape on the lakeshore. The composition of its pitched-roof forms is intended to forge a strong connection between visitors, boats and water. They are characterised by large canopies which frame views to and from the lake, but also provide all weather shelter around the perimeter of the museum. 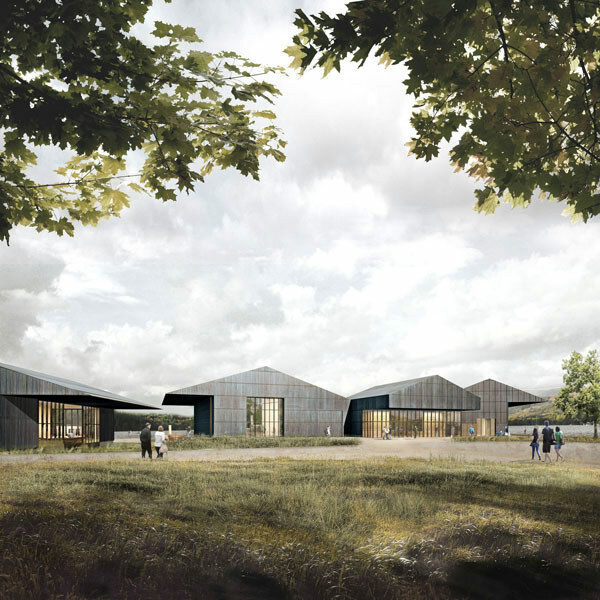 Carmody Groarke are announced as the winners of the competition to redevelop the Windermere Steamboat Museum in the Lake District National Park. Earlier this year, the Lakeland Arts Trust secured initial support for a £7.4m Heritage Lottery Fund (HLF) bid to take the project forward.